Heroes in what's known as the Marvel Cinematic Universe—which includes movies made by Marvel, but not those from other studios featuring Marvel characters—have been super-powered (Captain America, Hulk), space-based (Guardians of the Galaxy), a tech genius (Iron Man), agents of S.H.I.E.L.D. (Black Widow, Hawkeye) and even a god (Thor). "Ant-Man" is the studio's first "street level" superhero, about a likeably unextraordinary ex-con and ex-husband who gets tapped to put on a shrink-suit in order to do good. It's Marvel's equivalent of a B-movie, with a mission that's basically nothing more elaborate than an industrial-espionage heist (with complications, of course). Even the Avengers member who shows up for a couple of cameos is a second stringer. Like all Marvel movies, though, "Ant-Man" is slickly produced, often amusing and sufficiently action-packed to be entertaining, even if it does take a while to get going. It's hard not to wonder how much more visually interesting and better paced the movie would have been if fanboy favorite Edgar Wright ("Scott Pilgrim vs. The World," "Shaun of the Dead") had remained attached, however. After 11 years of preparation for helming "Ant-Man" that included co-writing the screenplay, Wright was replaced by director Peyton Reed ("Yes Man," "The Break-Up"), and Paul Rudd and Adam McKay receive writing credits along with Wright and Joe Cornish. Rudd also stars as newly ex-incarcerated burglar Scott Lang, who reluctantly agrees to rob a house with the aid of some amiably shady friends. Lang wants to be the hero his young daughter Cassie (Abby Ryder Fortson) already thinks he is, as his ex-wife Maggie (Judy Greer) puts it. Unfortunately, he has been fired from Baskin Robbins, has no future prospects and needs money to pay child support. What's a deadbeat dad to do? 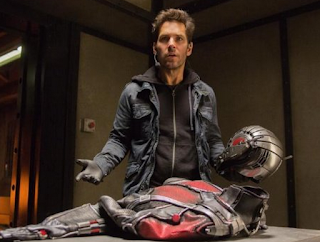 The loot at the house turns out to be the size-changing Ant-Man costume worn by Dr. Hank Pym (Michael Douglas) in a bygone era when he used it to carry out covert missions. Pym wants Lang to take over the role to prevent an evil former protégé from misusing the technology. Pym's no-nonsense daughter Hope (Evangeline Lilly) resents the fact that dad won't let her suit up instead, but she goes along with training Lang anyway. She also experiences the usual degree of sexual tension that always results from such close-proximity situations. The movie's armies of ants and shrink-and-grow CGI effects are terrific, especially during a cleverly tongue-in-cheek battle scene that takes place on a toy train set. Bad guy Darren Cross (Corey Stoll) is so nasty that he uses baby lambs as test subjects. And Lang's crew of easygoing and slightly dumb cohorts includes a scene-stealing Michael Peña as his former cellmate Luis. "Ant-Man" shares a major plot problem with "Terminator: Genisys" in that neither movie takes into account the concept that bad guys (or bad robots) just might be smart enough to make back-up copies of nefarious programs. Also, Hope and Claire of "Jurassic World" share the same helmet-and-bangs hairdo that has become this summer's visual shorthand for "uptight corporate hottie." "Ant-Man" also features the longest wait ever for a Stan Lee cameo. But like ants at a picnic, he always shows up!